When Narendra Modi decided in 2014 to contest for the Lok Sabha from Varanasi, apart from Vadodara in his home state, very few political wags discussed the whys and wherefores as they are doing in the case of Congress president Rahul Gandhi’s candidature from Wayanad, apart from Amethi, in this election. No one questioned the political motives and calculations of Modi. There was never any doubt about his victory from Vadodara. Why then did he choose Varanasi? Was he afraid that his legitimacy as prime minister would be less if he were elected to parliament from Vadodara/Gujarat than if he were elected from Varanasi/Uttar Pradesh? 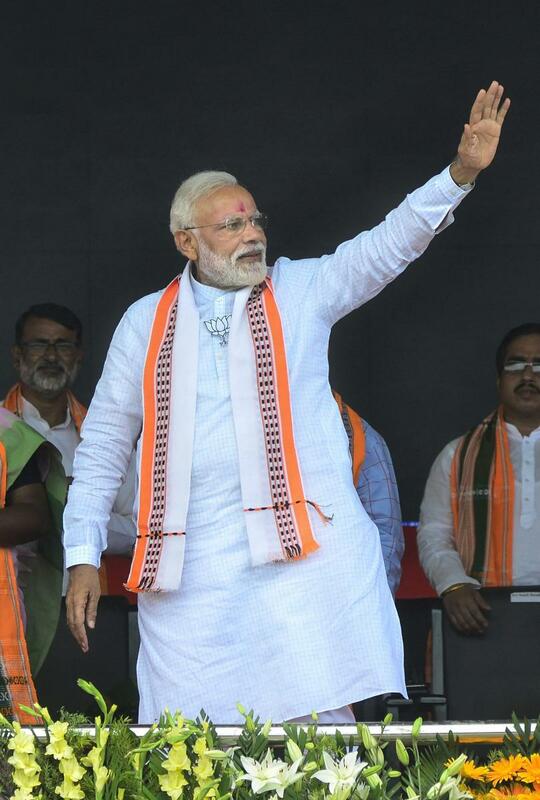 Modi analysts and apologists interpreted the decision to contest from Varanasi as an assertion and affirmation of the Hindu identity of the BJP and of Modi. No one asked the basic question as to why Modi or the BJP would have been less of a Hindu leader or organisation if he had won from Vadodara. The reason Modi’s choice of Varanasi as his second seat in 2014 was not scrutinised with the same political forensic tools as is being done in the case of Rahul Gandhi’s choice of Wayanad is the tacit assumption that Modi’s decision was based on positive symbolism of ideology while Gandhi’s decision represents flight from Amethi. Given the family precedents of Indira Gandhi fighting for the Lok Sabha from Chikkamagaluru in 1978 and from Medak in 1980, and Sonia Gandhi from Bellary in 1999, there is reason to suspect that ideology was not a factor, nor was the general appeal and popularity of the Nehru-Gandhis south of the Vindhyas. Even when they did not fight from the South, the Nehru-Gandhis and the Congress remained strong in peninsular India. In all these instances, there was an apprehension that the electoral prospects in Uttar Pradesh for the Nehru-Gandhis were not rock solid. I was in Varanasi in late March, and the local political analysts at a popular tea stall explained to me the political geography of Varanasi. Apart from the symbolism of being a Hindu city, it is also the dominant urban habitat in eastern UP, stood near the borders with Bihar, Jharkhand, Chhattisgarh and Madhya Pradesh, apart from being closer to the international border with Nepal. Modi’s candidacy from Varanasi would have an impact on the electoral prospects of the party in the neighbouring states. It was true that the BJP did really well in UP and Bihar, though the party was already entrenched in Jharkhand, Chhattisgarh and MP. So, the argument that Modi-in-Varanasi influenced the results in the neighbourhood is a tenuous argument at best. Modi from Varanasi is meant to send out a clear message that he and the party want to assert the Hindu identity and rights in modern, republican India. To that extent, Modi and BJP remain sectarian in their political affiliation, despite Modi’s empty chant of “130 crore Indians”. Interestingly, Rahul Gandhi’s choice of Wayanad can be interpreted to be a symbolic act affirming the multi-religious polity of India as Wayanad is home to Hindus, Christians and Muslims, and where Hindus are in majority. While affirming the Hindu majority status, it shows that Muslims and Christians are equally important. This conforms to the weak Congress version of secularism, where all faiths are respected equally. In many unintended ways, Modi’s choice of Varanasi and Rahul Gandhi’s of Wayanad represent the ideological moorings of their respective parties, a Hindu majority India of the BJP and Modi versus a Hindu majority sharing space with Muslims and Christians of the Congress. If symbolisms are to be pressed home, then the inferences cannot be avoided. Congress apologists for Rahul Gandhi’s choice have tried to explain the political geography of Wayanad, with the weak argument that it is at a tri-junction bordering Karnataka, Tamil Nadu and Puducherry, and that Gandhi’s presence in Wayanad will influence the party’s prospects across the South. Right now, Congress does not have much of a chance in Tamil Nadu, Andhra Pradesh and Telangana, and it is strong in Kerala and Karnataka even without Rahul Gandhi’s presence. The cosmopolitan Nehru-Gandhis will continue to remain popular in South India even if Congress loses its political clout across the South. And they will remain the ideal pan-Indian politicians with an appeal that transcends local identities. Modi had strenuously cultivated the image and partial status of a pan-Indian leader, but it is not based on the urbane cosmopolitanism of the Nehru-Gandhis. The reason for the BJP leaders’ pathological hatred of Jawaharlal Nehru is his nonchalant urbanity and cosmopolitanism. Modi has sought to base his pan-Indian image on a near-fanatical nationalist fervour, and he seems to have succeeded. The danger and limitation of Modi’s nationalist zeal is its Hindu flavour. The attempt to make a Hindu India is riddled with contradictions because a majority of Hindus are, in political terms, cosmopolitan by inclination. They remain fiercely sectarian in terms of religion, so the amorphous label of Hindu irritates them no end. It might be the secret desire of Modi to become like Nehru-Gandhis, his pan-Indian status derived from cosmopolitanism rather than the Hindu label. Whether he likes it or not, Modi would have to turn to Jawaharlal Nehru for inspiration to make India modern, which implies an India transcending its narrowly defined Hindu religious identity. Modi cannot hope to collapse the religious and cultural identity of the Hindu into the Indian national identity or reduce Indian nationalism into Hindu nationalism. Atal Bihari Vajpayee’s choice of Lucknow was more cosmopolitan than that of Modi’s choice of Varanasi. The only manner he can redeem his choice of Varanasi is to win the votes of the Muslim weavers of Benaras along with that of the Mallas, the boatmen on the Ganga in Kashi. It is clear, however, that Modi is no hurry to change the Hindu-oriented politics of his party, while Rahul Gandhi clings to the ‘secular’ vision of his party.